Got an unexpected call from Rail Operations Group ("ROG") who rang me at 6 p.m. on Monday 11th June 2018 asking if 86259 could rescue a failed train of theirs at Rugby! 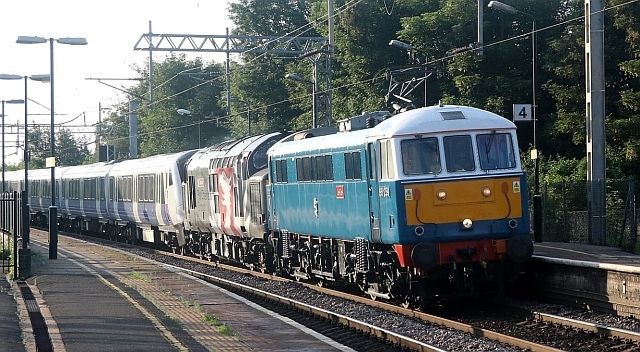 Diesel loco 37800 was hauling a new Electric Multiple Unit ("EMU") for Crossrail, in London, from Crewe to London. The diesel got overheated and had to be 'failed' so, whilst they had a path, they were now out-of-path on a goods line. I asked for three minutes in order to check with others involved with 259 and, with time to spare, called them right back with the 'OK but can I have it back a.s.a.p.' My desire to get 259 back to Rugby stemmed from an earlier 'helping hand' trip in February 2017, also to ROG and also from Rugby, which had resulted in my loco spending several days in Wembley. Luckily ROG's CEO, who also 'signs' 86s, was able to drive it back 'light engine' on the following day. The Bombardier EMU was being taken to Old Oak Common Depot, between Harlesden and East Acton, so 86259 could not quite get it all the way but once it was in West London diesel shunters are readily available! Being a Monday evening, photographers were not out in abundance like they are at weekends but I found one photo by MKRail at Bletchley on Flickr and there are two videos, one at Wolverton and the other at Watford Junction on YouTube. June 11th 2018 86259 hauling 37800 and 345035, Rugby to London.